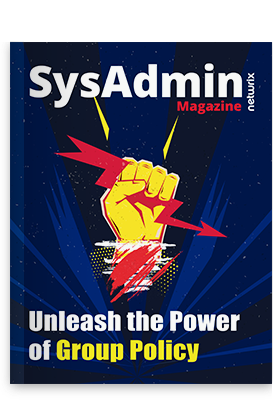 In the previous article, named PowerShell Scripting Tutorial for Beginners, we explored how to use the PowerShell console to execute scripts and learned what cmdlets are, how to get their properties and how to use pipes to pass data from one cmdlet to another. In this article, we will move on to variables and arrays, including what they are and how we can create, remove and change them. As we can see, our $var1 variable has the “System.String” type. Text string $var1 = "Netwrix"
Array (discussed in detail later in this article) $var3 = "first", "second", "third"
To add an item to a hash table, you can either assign it a key that does not already exist or use the Add () method. If the assignment is made to an existing key, the value of the key changes to the assigned one. To remove an item from a hash table, use the Remove () method. You probably already understood that you can write to the variable not only some definite value and noticed the class System.Object  in the table. To this variable you can write the output of any cmdlet. You can create a variable by simply assigning it a value. For example, the command $var4 = “variableexample” creates a variable named $var4 and assigns it a string value. The double quotes (” “) indicate that a string value is being assigned to the variable. You can output a variable a .txt, .csv or HTML file. An array is a type of a variable. It is a set of components (array elements) arranged in a certain order. Elements of the array are numbered sequentially, and you access an element using its index number. 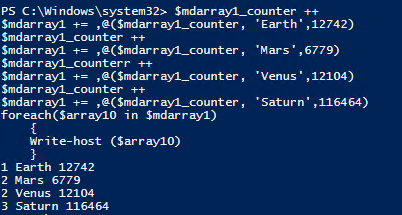 As you can see, in this case, PowerShell created an array (System.Array). Of course, you cannot always tell in advance how many objects will be received as a result of executing a particular command, so you need to have code that will always treat the result as an array. Finally, you can also create an array using subexpression operator “@“, which forms an array even if no objects at all are specified. It is very convenient to initialize a variable as an array, and then add objects to it without worrying about their number. PowerShell arrays are zero-based, so to refer to the first element of the array $var3 (“element zero”), you would write $var3 . $var3 = "first", "second", "third"
Multidimensional arrays are variables that can be used to store information in a table without having to write it to a real database. It looks like a hash table, but it can store different types of information, such as strings and integers. In fact, you can imagine a multidimensional array as a table with columns and rows, where each cell has its own index inside a PowerShell environment. To sort an array with more than one data type, you need to use the Sort-Object cmdlet. $array5 = "one", "two", "three", "four", "five"
In PowerShell, if a variable is null, you can’t apply any methods to it. To print a whole array, we can use the same methods described for printing variables. In this article, we learned about variables and their types. Then we explored one variable type — the array— in detail and learned how to play with it. With this information, you are ready to dive into PowerShell even deeper.